Last year, I visited San Francisco. After a nice walk on the Golden Gate Bridge bridge we stopped at the little gift shop by the parking lot. I went in thinking I’d buy a nice little replica of the Golden Gate Bridge or a T-Shirt or something. But looking at the label, every stinkin’ thing in the store said…MADE IN CHINA. And so I left. I figured, if I wanted to buy something in San Francisco, at the very least it should come from San Francisco and not 6,000 miles away. Pretty soon, I realized no matter where I went, whether a botanical garden in Arizona or a National Forest in Washington, every gift shop had lovely little souvenirs–all of them made in China. The last straw came for me when I visited Amish country in Lancaster County, Pennsylvania. I went into a gift shop in an old fashioned barn. I saw a cute doll that looked handmade. I wondered who the local Amish craftsman was that had made it. But you guessed it. I flipped the doll over and the label said…MADE IN CHINA. Something I used to do when I was in high school and college was, every time I’d travel, I’d pick a little daisy and press it in the pages of my photo album (remember those?) along with the photos I took of a place. My prized possession was picking this daisy and smuggling it home from the Soviet Union in 1987 on a high school trip. Back in those days, there were so many ways you could get thrown in the gulag that I wasn’t sure if I was breaking any Soviet law. As Yakov Smirnoff might say…in Soviet Union, you don’t pick daisy…daisy pick YOU! (if you’re under 40, Google it). Being the sentimental type, I found that I often collect little things as ways to recollect moments in time (which is what the word “souvenir” is supposed to mean, pardon my French). Years (and years) ago when I was in junior high school, our class saw the Broadway show Les Miserables and I saved a breadstick from dinner that night. I kept that breadstick for the next 25 years (breadsticks are surprisingly resilient). I found out that I wasn’t alone. My toosie-wootsie Lisa told me that on a trip to St. Maarten last year with friends, before she left to come home she scooped up some sand from the beach and saved it so she could always keep a part of her trip with her. Which brings us to today’s post. I was recently contacted by a great organization called bottledBrooklyn. They sell…a piece of cloth in a test tube stained with dirt and grass. That’s right, it’s a hand-made piece of artwork that consists of a test tube that contains a piece of cloth that’s been lovingly rubbed with dirt, grass, and water from the streets of Brooklyn. It’s hermetically sealed (with vegan-friendly soy-based wax) so Brooklyn stays inside the bottle for perpetuity, no matter where in the world you display it. It’s one part artwork, one part social commentary, one part cleverness, and one part chutzpah. Dare I say it’s like Brooklyn itself? Fuhgeddaboudit! The cynical among us might say that this idea is as cockamamie as Ralph Kramden’s shoe polish that glows in the dark. But for the price you pay, you get a neat piece of artwork that you can display anywhere that’ll be sure to stir up conversation and allow you to pontificate about the borough you love so much. After all, what’s more of an authentically Brooklyn for someone visiting Brooklyn: this or an ugly T-Shirt that’s spent less time in New York for less time than they have? It’s the perfect gift for anyone who loves Brooklyn, and makes a fantastic gift for so many different kinds of people, from a parting gift for a Brooklyn resident or student who’s leaving the borough so they can always keep a piece of home close to them, to a gift a Brooklynite can give anywhere he or she goes to share a literal bit of home with everyone they visit, to a souvenir for someone who’s been to Brooklyn and has enjoyed anything and everything from a Peter Luger’s steak to the Brooklyn Botanical Garden to a walk on the Brooklyn Bridge to a Grimaldi’s pizza to a ride on the Cyclone. 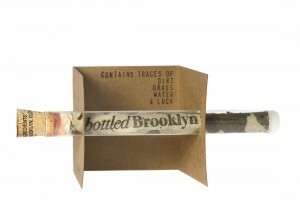 It comes with the Brooklyn-infused cloth inside the sealed test tube, with a decorative cardboard stand, a Brooklyn map, and a drawstring pouch. And for every one of these that’s sold, the company will donate $2.50 to City Harvest, a phenomenal organization in Manhattan that collects over excess food from the food industry (restaurants, grocers, farms, cafeterias, and manufacturers) and delivers it by truck, bikes, and by foot to over 600 community food programs, feeding over 300,000 of the hungry in New York. Other variations are also available. BottledNYC, which sells for $96 ($10 which goes to City Harvest), is a collection of five distinctly marked test tubes with dirt from all five boroughs of New York: Brooklyn, the Bronx, Staten Island, Queens, and Manhattan. Inside was a kit, complete with everything you need to make your own “Bottled Anywhere” souvenir. 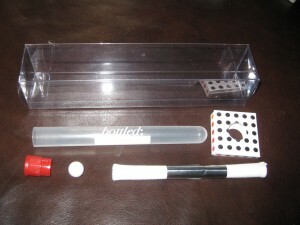 Inside a beautifully designed clear plastic box comes a clear plastic test tube with a white cloth inside and a marble. You can wipe the cloth on anything you like, stuff it in the test tube (or you can forego the cloth and save any small material like sand or confetti). A red cap and a marble keep the contents securely sealed inside. Once you’ve made your kit, you can write the place name on the tube. The cool thing about this kit is that what you store in it is limited only by your imagination. 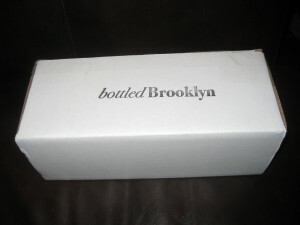 I like the quote from BottledBrooklyn’s Blog: Originally, we wondered if it was possible to take something of no value, Brooklyn dirt, and turn it into something valuable that could help the community. The irony of this statement, of course, is that what’s contained in these test tubes, whether it’s genuine dirt from Brooklyn or your own bottled memories from anywhere, is infinitely of more value than the cheap imported keychains and mugs that litter gifts shops everywhere.